Closed room with drum dryer installation inside. Entrance to the room by a roller shutter. 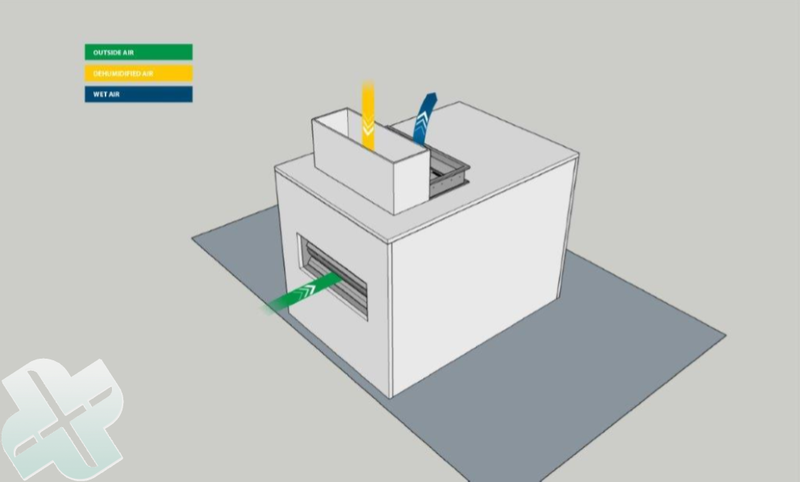 Airflow per room: Inlet outside air (green) inlet dehumidified air (orange) outlet wet air (blue). Drying of seed in a conditioned room with drums. Per drum-level an outlet (A) and per outlet a high pressure fan (B). 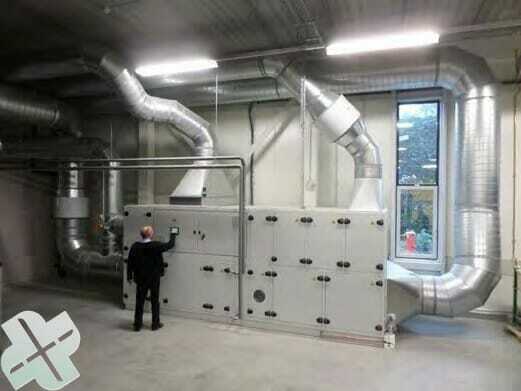 The air drying process is an expensive business; this applies not only to condensation and adsorption dryers, but also to the hybrid dryers of energetic interest (combined condensation and adsorption drying). 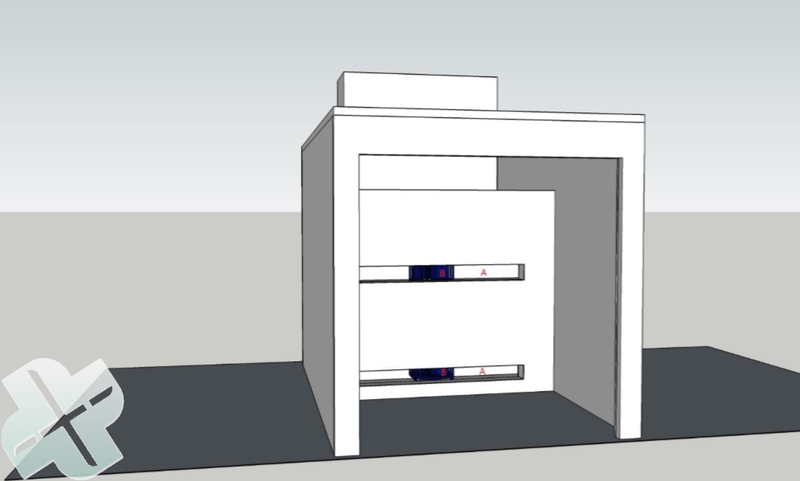 It is not economical to place an air dryer at every drying installation. Continuous drying does not take place at all installations, and dried air is not required constantly. 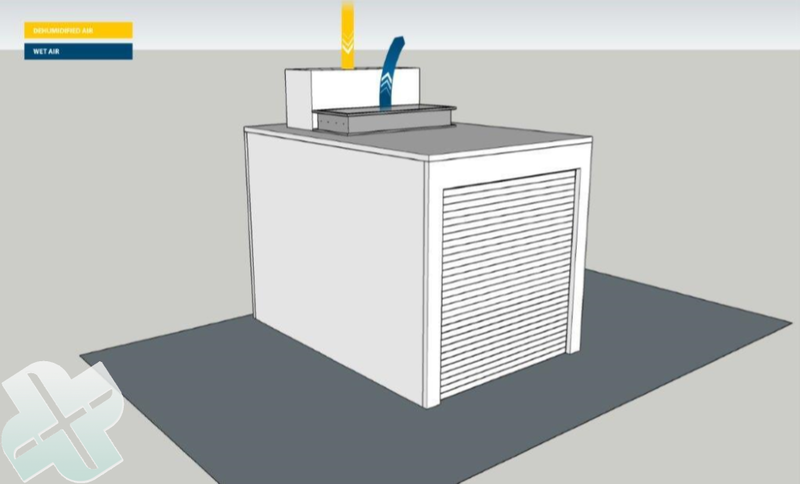 Agratechniek has developed a principle at which a central air dryer (F) brings the dried air to where it is needed. 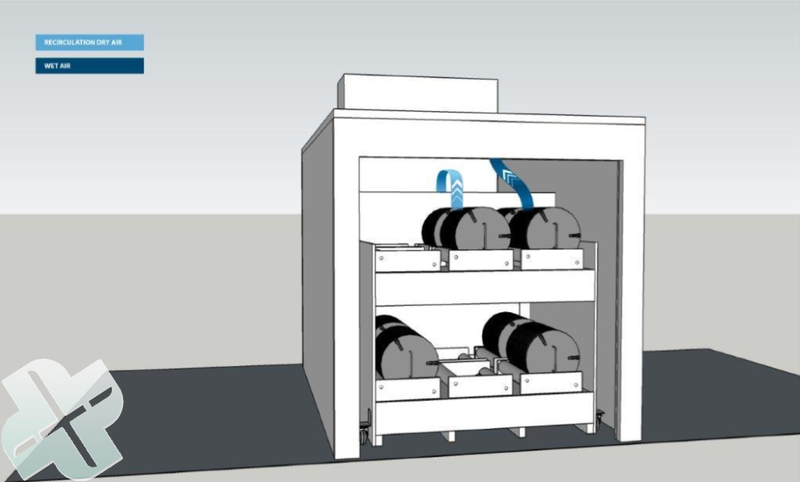 Various drying installations, like a closed drum dryer (A), open drum dryer (B), individual drum dryer(C), mobile drum dryer with outside air (D) and mobile drum dryer with inside air (E) are connected to a central air duct (G). Thanks to the advanced ABC process the dried air is discharged automatically to where it is needed at that moment. During the seed drying process, a lot of moisture can be discharged using heated up outside air. Unfortunately the conditions of the outside air are not always suitable to reach the desired equilibrium moisture content at the end. Especially now that more seed companies want to receive, store and package the seed with a lower moisture content. To be able to dry the seed quickly and successfully, dried air is needed in the last phase. 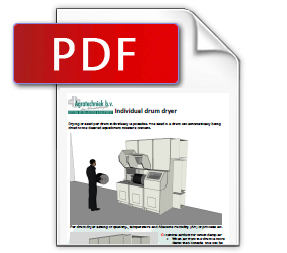 It is therefore not necessary to have each drum dryer provided with an air dryer!